Angler Rob with 420 lb Blue Marlin! 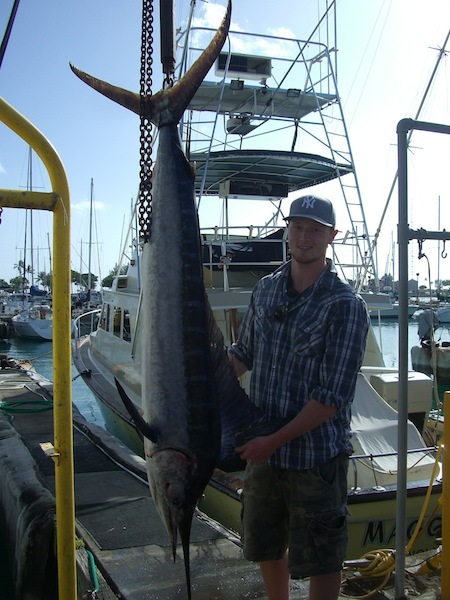 Mahalo to Rob for choosing Maggie Joe Sport Fishing! 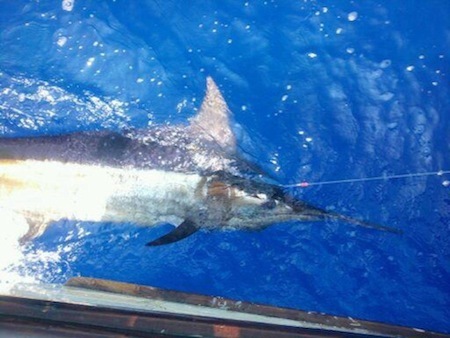 He joined Captain Matt aboard the Ruckus on a sport fishing charter. 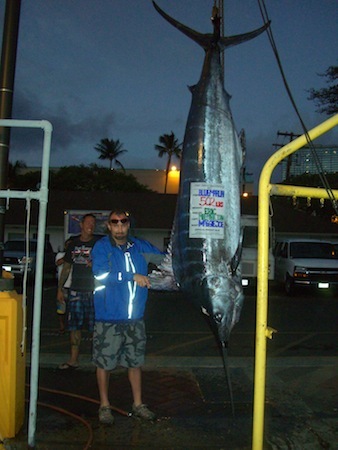 While deep sea fishing outside of Honolulu, Oahu he hauled in this 420 lb Blue Marlin! Congratulations and Hana Hou! Ken, Robert and Jeremy with 2 Mahi Mahi and Short Billed Spearfish! 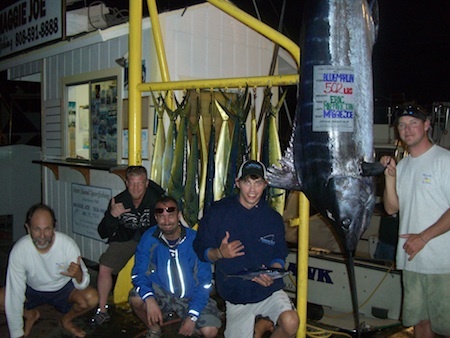 Mahalo to the guys from Canada for choosing Maggie Joe Sport Fishing! Ken, Robert and Jeremy joined us aboard the Sea Hawk on a sport fishing tour. After departing Kewalo Basin, next to Waikiki, they spent the day deep sea fishing outside of Oahu, Hawaii and hauled in 2 Mahi Mahi and a Spearfish! Hana Hou! The Latagne Family with 80 lb Stripey, 15 Mahi Mahi, 14 Aku and 8 Shibi! Mahalo to the Latagne Family for joining us aboard the Maggie Joe! Captain Mark’s family, the Latagne’s, joined us on a sport fishing charter and spent the day deep sea fishing outside of Honolulu, Oahu. Congratulations on your haul! Aloha and Hana Hou! 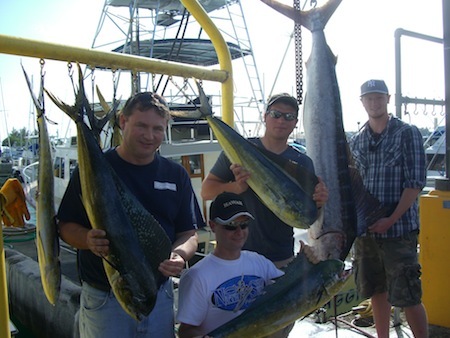 Joe, Joey, David and John with 6 Mahi Mahi and a Stripey! Angler Joe with 82 lb Striped Marlin! 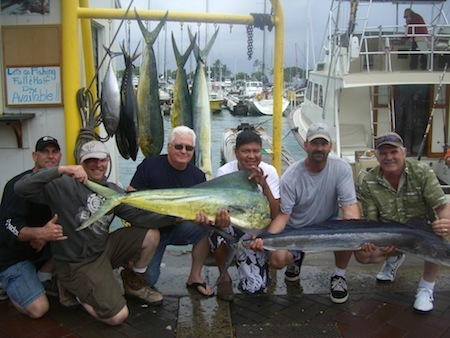 Mahalo to Joe, Joey, David and John for choosing Maggie Joe Sport Fishing! The guys joined Captain Matt aboard the Ruckus on sport fishing charter. After departing Kewalo Basin, next to Waikiki, in the early morning and spending the day deep sea fishing outside of Honolulu, Hawaii they were able to bring back 6 Mahi Mahi and an 82 lb Striped Marlin! Congratulations and Hana Hou! Eric, Brian, Captain Mike, Deckie Johnny-bobo with 502 lb Blue Marlin and 13 Mahi Mahi! Angler Eric with 502 lb Blue Marlin! 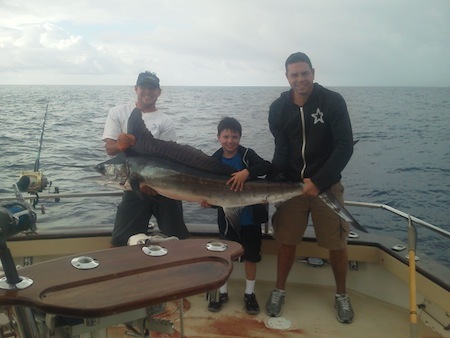 A big Mahalo to Eric and Brian for choosing Maggie Joe Sport Fishing! Eric and Brian joined us aboard the Maggie Joe with Captain Mike, Mark and Deckie Johnny-bobo on a sport fishing charter. After 45 minutes in the fighting chair Eric pulled up this beast of a 502 lb Blue Marlin! Congratulations and Hana Hou! 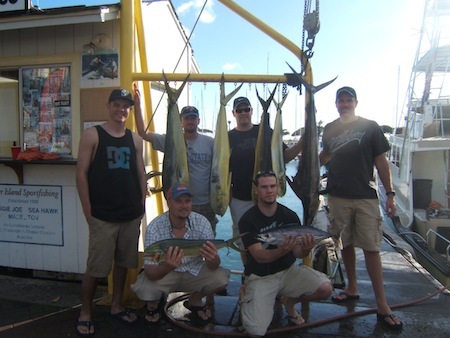 Shane, Dustin, Bill, Brad, Floyd and "The Chief" with Mahi Mahi, Aku, Shibi and Short Billed Spearfish! Mahalo to Shane, Dustin, Bill, Brad, Floyd and “The Chief” for choosing Maggie Joe Sport Fishing! The group departed Kewalo Basin, next to Waikiki, aboard the Ruckus with Captain Matt on a sport fishing tour. It was a great day out on the water as they hauled in a Short Billed Spearfish, 4 Mahi Mahi, 2 Shibi and 1 Aku while deep sea fishing outside of Honolulu, Oahu! Aloha! Jake and his Striped Marlin with Dad and Capt Mark! Congratulations to Jake on catching a nice Striped Marlin! Jake spent the day with his dad, Captain Mike and Mark aboard the Maggie Joe on a sport fishing charter. While deep sea fishing outside of Honolulu, Oahu he hauled in this nice Stripey! Hana Hou! 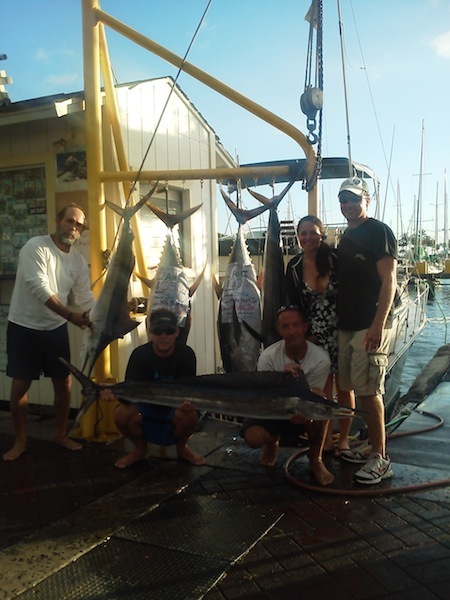 Chris and Jen with pair of Ahi, Striped Marlin and Ono! 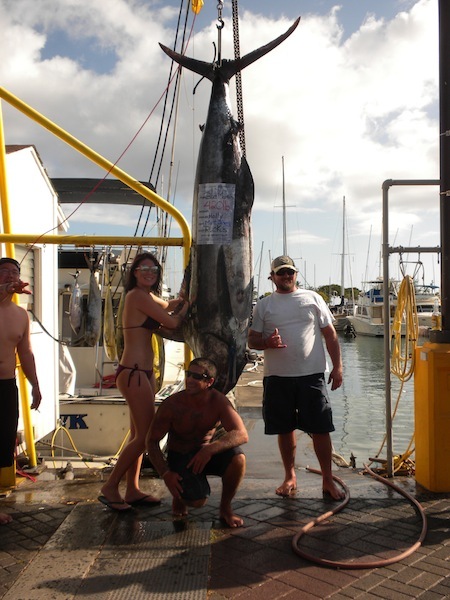 Mahalo to Chris and Jen for choosing Maggie Joe Sport Fishing! 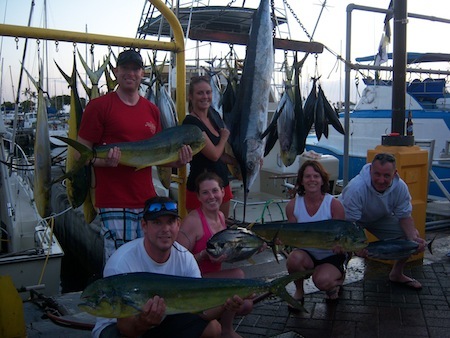 The couple joined Captain Mike and Mark aboard the Maggie Joe on a full day sport fishing tour. Departing Kewalo Basin, next to Waikiki, in the early morning it turned into a great day as they hauled in a pair of Ahi, a Stripey and an Ono while deep sea fishing outside of Honolulu, Oahu! Mahalo and Hana Hou!